Disappearance without trace of ships at sea still occurs in our own time but was a more common happening before the days of radio allowed transmission of distress calls. Many such losses in the past were associated with poor maintenance and poor operational procedures of merchant ships. A more sinister element was often also at work – indeed the great British reformer Samuel Plimsoll (1824-1898) devoted much his career to combating the evil of “coffin ships”, unseaworthy vessels deliberately sent to sea by unscrupulous owners so as to claim insurance when they were lost. Disappearances of naval ships were much less common, reflecting high standards of construction, maintenance, seamanship and discipline. 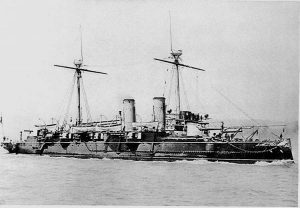 One such loss – the modern cruiser Regina Regente – was however to be sustained by the Spanish Navy in 1895. By this period the once gigantic Spanish overseas empire had shrunk to Cuba, Puerto Rica, the Philippines and a few small islands in the Pacific. Protection of these possessions, and of trade with them, demanded naval forces that the country – bled dry through the nineteenth century by a succession of civil wars and internal convulsions – could ill afford. Deciding how to create a balanced fleet suited to strategic needs was a challenge and in the event what funds were available for a modern navy were to a great extent diverted to construction of cruisers suited for overseas service. The “protected cruiser” had emerged in the early 1880s as a new warship type, its engines and boilers protected by an armoured domed deck and powerfully armed for their size. Long endurance, and a respectable turn of sped for the era (typically some 20 knots maximum) made them well suited to commerce-protection, commerce-raiding and – when needed – shore bombardment in local or colonial conflicts. The Royal Navy led the way in development of this type and a British company, Armstrongs, was to supply such ships – known as “Elswick Cruisers” – to many of the world’s navies. 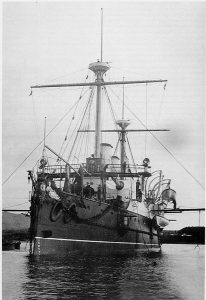 When the Spanish Navy contracted the Thomson shipyard at Govan, on Scotland’s Clyde River, to build the Reina Regente (“Queen Regent”), for launch in 1887, it would gain an ultra-modern warship. It was foreseen that it would be one of a class of at least three, the others to be built to the same design in Spanish yards. Of 4725 tons and 320 feet long, the Reina Regente would be capable of a 20-kont maximum speed. Armament would be four 8” guns, mounted in separate shields, two-by-two, fore and aft, with six 4.7” weapons spaced in threes on either side. These guns were supplied not by Britain, but by the Spanish firm Hontoria. Smaller weapons were also carried as well as five fixed torpedo tubes. As such the Reina Regente compared well with Royal Navy counterparts of the time such as the Mersey Class of 1885, of similar displacement, though with a lower top speed, and armed with two 8, ten 6” and two torpedo tubes. 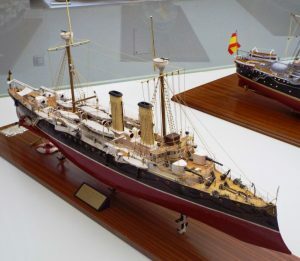 The Reina Regente entered service in 1888 (photograph on right was taken the following year). As intended, construction also started at the Ferrol naval shipyard in North West Spain, of a sister, the Alfonso XIII. Work proceeded slowly – she did not enter service, and then only as a training ship, until 1896. Unsuited as such to service in the Spanish-American War, she was only completed fully in 1900, by which time her design was obsolescent. The construction at Cartegena of another sister, the Lepanto, was protracted in the extreme. Laid down in 1886, she too did not enter service until 1900. By this time Reina Regentes, the lead ship of the class, was long gone. Her seven-year career since completion appears to have been uneventful until March 1895. On the 9th of that month she departed the southern Spanish port of Cadiz, encountering stormy conditions. How far she got on her short, approximately 60-mile, course to her destination of Tangier in Morocco, or whether she turned back for shelter at Cadiz, is unknown, as the location of her wreck has not been identified. Hope for her survival was lost as wreckage began to be washed up in the subsequent days on the coast near Algeciras, between Cadiz and Gibraltar. The ill-starred ship had taken with her a total of 420 men and there were no witnesses to her end. It may be mentioned, as an aside, that another minor European Navy was also to have a “Queen Regent” in service, though at a slightly later date. The Netherlands Navy’s 5000-ton coast-defence ship Koningin Regentes of 1902 also referred to the mother of an under-age monarch. Queen Emma, mother of Queen Wilhelmina served as regent of the Netherlands from 1890 to 1898, while the Spanish cruiser was named after Queen Marina Cristina, mother of the Spanish king Alfonso XIII, served as regent from 1886 to 1902. Whilst in La Coruña in April 2016, I bought a book about the loss of this ship in the excellent Libreria Arenas bookshop. The book was entitled EL CRUCERO REINA REGENTE Y SU HUNDIMIENTO EL 9 MARZO DE 1895 by Joaquín Gil Hondubill (published La Spada y La Pluma [ISBN 84 933793 1 X]), and although my Spanish is quite rudimentary, I managed to read most of it.